As a local playwright, performer, songwriter, writer, and artist, Eppchez! (link is external) focuses on colonization, consumption, latent capitalism, and other themes. Eppchez! has a solo performance this weekend, April 6-8, at the Rotunda in West Philadelphia as part of the (re)FOCUS Fest(link is external) for independent artists in the Philadelphia area. The bilingual performance, titled Publik Private(link is external), explores the lives of two historical figures: a Basque-born trans man, Lieutenant Alférez, who was a nun in a convent before seeking his fortune in Latin America and participating in the violence of the Spanish Conquest; and a Quaker-born evangelical preacher who believed they were resurrected as a divine spirit of life that was neither male nor female and traveled around the Northeast of the U.S in the 18th century. The production is “about witnessing to these ancestors and about seeing them in their queerness and holding them accountable to the ways that their whiteness was oppressive,” said Eppchez!. Tickets are available for purchase online(link is external) through the (re)FOCUS Festival. 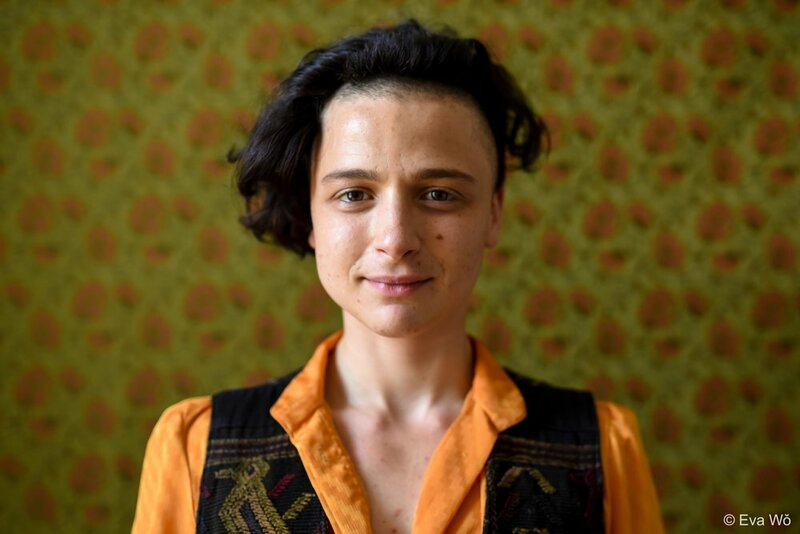 Eppchez!, who is nonbinary and uses the pronouns ey, em, and eir, took the time to speak with AL DÍA about eir creative vision, eir identity as a Latinx and nonbinary artist, and the power of art to help us learn from and interact with our histories to better understand the world today. Can you tell us a little bit about your latest production? It’s really just me discovering and figuring out how to tell stories of these two historical people’s lives, and it’s mostly about bearing witness to them as ancestors. There’s some element of conversation and thinking about how we can connect with ancestors even when in hindsight we believe in different things. Sort of just a combination of seeing them fully and seeing them in ways that they would actually think of themselves — and seeing them as full, complex people who were not always doing the right thing. The production itself is bilingual? Yeah, it was important to me that everything that the Lieutenant says is in Spanish, because that language is in their own words because he wrote an autobiography. So what an incredible opportunity to be able to actually use his words to put his life on the stage. So it’s based on an actual historical text? Yeah, a lot of the segments about him are from his autobiography. It’s interesting because he’s from the Basque country and it’s 15th century Spanish so it’s double wonky but 15th century Spanish is much closer to modern day Spanish than 15th century English is, or even than 18th century English, which was the other character. I am very clear in my mind that the Lieutenant Nun is a trans man and that seems very obvious to me. Most historians are really reticent to use that language to talk about him or his experience, because there weren’t other people that they’re aware of that did that. But because of how adamant and violent he is towards people who refer to him as female during his life, it is clear to me that that would not be his preference, and that he very much conceptualized and thought of himself as a man. But it does create all of these language problems for Spanish. For me as a nonbinary person it’s been really difficult to think about that, but for the Lieutenant, he was writing in the first person so it mostly didn’t affect his language that much, but when he is speaking reflexively, he definitely uses male signifiers. That’s another way in which it’s pretty clear what his preference is. You’re gender nonbinary, so for you in Spanish how do you identify yourself? It’s hard, it’s kind of impossible and it’s meant that it’s just hard for me to exist in Spanish. My tía is like so how do we do this? Apart from making up a whole kind of different linguistic rules, there’s not really a way to do it. You end up settling for masculine referencing but it’s not honest, it’s not true. I’m not the only Latinx non-binary person by any regards. I don’t know if a lot of people are thinking about how to fix it or solve it or do something different but I know a lot of people struggle with it. For you as a playwright, what do you think the particular power of theater is for exploring queer and trans issues, or queer and trans issues in the Latinx community? For me one of the reasons I’m a playwright and not just a performer, it all goes back to there not being non binary or trans characters for me to play, generally, and so I began to feel like, oh if I want to work and have interesting roles, then I guess I just have to write the shows myself. It’s not how I first got into playwriting but that is a reason why I do solo shows. But for me, gender is never going to be the most interesting thing about a character that I’m writing. It’s always just that, ‘Oh, this character happens to be non binary, but like there’s a lot else that is going on.’ And that’s true for these two historical figures and I think that’s why I was drawn to them. In their perspective, their gender is sort of irrelevant. They’re just trying to exist and be in the world that they were given, and be able to live comfortably. The whole idea thinking about historical figures — it [brings up] the fact that all of these identities are not new things. Maybe the identities are new, but the people always existed. The people always existed, and just because in their time there wasn’t language for them to be known by generally, that doesn’t mean that they didn’t exist or wouldn’t have chosen that language if it did exist, and I think that there’s lots of people who since they couldn’t name the thing that they identified with, they were never able to find a more authentic identity for themselves. But in the case of these two people, their knowledge of themselves was so vivid they just followed that even though there wasn’t language for it. And to me that’s just a really powerful testament to the fact that we’ve always been here. I think for me placing trans people in history or just seeing us there is a powerful part about this performance, because everyone is always like , I don’t know...there’s a lot of sort of belittling the feelings: ‘What are all these new things, all these new language, new identities, what are these kids up to?’ And like, no, we’ve always been here. I have non-binary friends who are in their sixties and I can’t imagine how powerful it must be to see a younger generation that is able to be so loud and normalize it so much. But there were always people making androgynous choices with their presentation, and I think it’s really easy to forget that. I mean think about how people are going to look at this time that we’re in right now, in 200 years. Part of the fear is: Will my identity be erased then? I think that’s part of what this show, or the question that this show asks too: Will I be visible in that future? Or people like me? That’s a powerful question. I feel like it goes to, I forget what the exact phrase is, but the victor writes history. How much those in power define what is even preserved of history or the terms that are used to describe it. It’s interesting because I would say even more than gender this is a piece about colonization, and the fact that the Lieutenant Nun is part of that history, but he’s definitely really on the oppression side of things... I think in general and with colorism and all that that we face as Latinx people, there’s a lot of temptation to just look away from that part of history and the fact that in all of us both of those things exist. Both the brutal violence of that colonization and the justifications for it...that whole white mentality that is really tempting to look away from it and never have to contend with it. But I think it is important to tell the stories and not as a way to not just tell them, but to have to contend with them. Yeah, I think asking those questions, keeping those questions alive, that is a big answer to your question before, of why are you a playwright. I think [it’s] similar to the kind of work that scientists do — you ask a question and you do experiments, and you see what happens.